Background: It is unclear whether patients can be taken off suppressive antibiotics with infected retained instrumentation. This study aimed to retrospectively analyze the perioperative course and antibiotic regimen that led to the clinical intervention of patients with infected spinal instrumentation. Methods: Consecutive adult patients with spine instrumentation who suffered surgical site infections (SSI) requiring debridement were retrospectively analyzed. The patients were grouped into 4 cohorts based on their clinical intervention: removal of instrumentation, reinstrumentation, retention of instrumentation with continued antibiotic suppression, and retention of instrumentation with no antibiotic suppression. Patient factors, infection factors, debridement, and antibiosis were compared. Results: Of the 67 patients with SSI after spine surgery and instrumentation, 19 (28%) had their instrumentation removed, 6 (9%) had their instrumentation exchanged, 25 (37%) had their instrumentation retained and were on antibiotic suppression, and 17 (25%) had their instrumentation retained without any suppression. Those who had their instrumentation removed had a later presentation of their infection averaging 85 days (range 6–280 days) postoperatively. There was an earlier presentation for those who retained their implants, with suppression averaging 19 days (range 9–39) and no suppression averaging 29 days (range 6–90 days) post operatively (P < .001). Conclusions: None of the patients with retained instrumentation without suppression had recurrence of infections after long-term follow-up. Lifelong antibiotic suppression may not be required with SSI that present early after early aggressive debridement. Patients with infections detected later are difficult to treat without removal of their original instrumentation. Clinical Relevance: This study presents the outcomes of surgical and antibiotic factors in patients with infected spinal instrumentation. However, SSI with instrumentation presents a unique problem to the spine surgeon.14⇓⇓⇓–18 A staged removal of implants is often not possible, as the stability of the spine must be maintained with instrumentation until fusion.17 Even once fusion is achieved, there is evidence demonstrating worsening of deformity after the removal of instrumentation.15 Thus, the treatment options are limited to removing the instrumentation after fusion, reinstrumenting the spine, or retaining the instrumentation with antibiotic suppression. There is no published algorithm or consensus statement in spine literature that dictates the surgical decision making for infected spinal instrumentation. The optimal antibiotic regimen for patients who are retaining their spinal instrumentation despite SSI is not well understood and is often left to infectious disease (ID) consultants to determine. Recommendations from ID consultants at our institution often consist of a course of long-term IV antibiotics followed by lifelong oral suppression. The basis for this regimen comes from the idea that the implants are seeded and will continue to be a source of infection for the duration they are left in. However, the decision of the duration of IV antibiotics and subsequent oral antibiotics is not one to take lightly and without input from the surgeon. Often, the surgeon is the one who has the closest follow-up with the patient and also witnesses the side effects from these nonbenign medications. Although there are studies examining the treatments for spinal implant infections,19–24 the literature does not answer whether lifelong antibiotics are necessary for retained spinal instrumentation after SSI. This study aims to retrospectively analyze the perioperative course and antibiotic regimen of patients who suffered an SSI after spinal instrumentation. This preliminary data shed light on whether lifelong antibiotics are necessary for suppression after infection of an instrumented spine. It also aims to present trends in this retrospective analysis of these infections that may aid in developing a future algorithm of when to remove, exchange, or retain infected spinal instrumentation. An institutional review board for this retrospective analysis was obtained (University of California, San Francisco, Institutional Review Board 15-16807). Consecutive adult patients with SSI after spine surgery at a single institution from 2007 to 2013 were retrospectively analyzed. Inclusion criteria included adult patients over the age of 18 with spine instrumentation who suffered an SSI requiring surgical irrigation and debridement. An SSI was defined as a revision spine surgery for SSI with culture positive drainage or tissue samples. The patients were grouped into four cohorts based on their clinical intervention: removal of instrumentation, reinstrumentation, retention of instrumentation with continued antibiotic suppression, and retention of instrumentation with no antibiotic suppression. The surgical decision making was based purely on the surgeon's preference, with no particular algorithmic approach, as there is none defined in the literature. Some guiding principles included the index revision performed on patients with wound findings consistent with underlying infection. The decision to retain or remove instrumentation was based largely on the severity of the infection at initial debridement, the response to the prior surgical debridement, and the probability of the stability of the spine at the time of debridement. The response to the prior surgical debridement was defined both by the superficial appearance of the wound after the most recent surgery and by the trend in inflammatory markers. Being off of antibiotic suppression was defined as not being on any antibiotic therapy at the time of the most recent surgical follow-up. Follow-up times were defined as the time between the day of surgery and the most recent follow-up date. Four different domains were compared between the four cohorts: patient characteristics, infection characteristics, debridement characteristics, and antibiosis characteristics. Univariate analysis was conducted between the four cohorts to determine which variables were different. Descriptive statistics were performed on the data. An analysis of variance F test was used to test continuous variables for significance. The Fisher exact test was used to test discrete variables. A P value of .05 was considered statistically significant. Of the 67 patients with SSI after spine surgery and instrumentation, 19 (28%) had their instrumentation removed, 6 (9%) were reinstrumented, 25 (37%) had their instrumentation retained and were on antibiotic suppression, and 17 (25%) had their instrumentation retained without any suppression. Those without antibiotic suppression have the longest follow-up, averaging approximately 4 years off of antibiotics (range 293–2823 days) with no need for further intervention, compared with other cohorts. All patients who had their instrumentation removed or exchanged remained on antibiotics until that surgery except for 1 patient who was off of antibiotics for 1 year but had a recurrence of drainage requiring implant removal. Patients with their instrumentation removed had their instrumentation implanted for an average of 503 days (range 26–2303 days). Patients who were reinstrumented had their original instrumentation implanted for 343 days (range 21–686 days). The patients without suppression discontinued their antibiotics because they were either prescribed short antibiotic courses, had gastrointestinal side effects, or were advised to do so by the infectious disease consultant. Fourteen of the 67 patients had documented side effects to antibiotic therapy: 11 complained of gastrointestinal side effects, 1 of dizziness, and 2 of rash. Three of the 6 patients who were reinstrumented remain on oral antibiotic suppression. Three of the 6 are no longer on suppression antibiotics and have an average of more than 5 years of follow-up off of antibiotics (range 1364–2659 days) with no need for further intervention. Patient characteristics (Table 1), including age, gender, and American Society of Anesthesiologists score, did not vary significantly between the three groups. Figure 1 is a graphical representation of the clinical outcomes versus the number of instrumented levels. 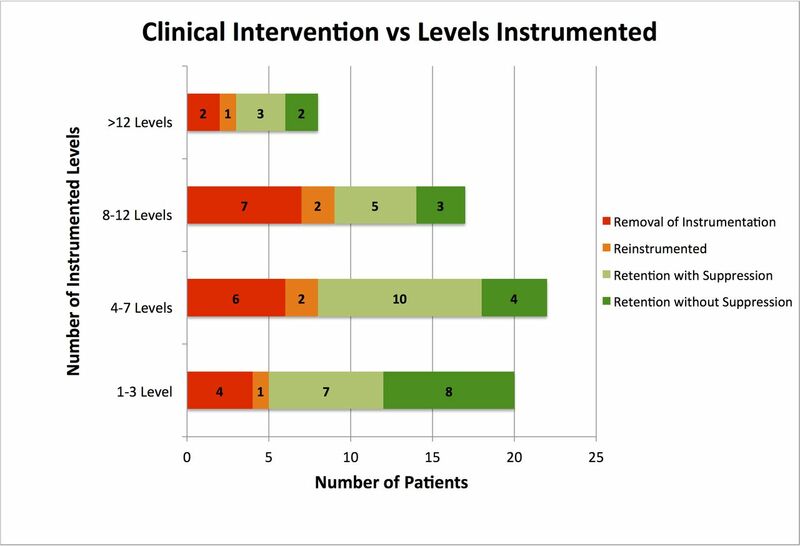 Graphical representation of the clinical intervention relative to the number of instrumented levels. Those who had their instrumentation removed or were reinstrumented had a later presentation of their infection, with removal averaging 85 days (range 6–280 days) and reinstrumentation averaging 123 days (range 4–323 days) postoperatively. There was an earlier presentation for those who retained their implants, with suppression averaging 19 days (range 9–39) and no suppression averaging 29 days (range 6–90 days) postoperatively. The number of polymicrobial infections between the cohorts trended toward significance (P = .077), with those with instrumentation removed or reinstrumentation having over twice as many patients with polymicrobial infections than the cohorts with their instrumentation retained (Table 2). Patients with retained instrumentation without suppression had a single debridement, and there was a significantly greater number of debridements in those with instrumentation removed and exchanged (Table 3). The probability of retaining instrumentation dropped from 63% after the first debridement to 26% after the second and 17% after the third, and no patients were able to retain instrumentation if they had 4 or more debridements (Figure 2). No significant differences emerged when examining intraoperative interventions (Table 3). 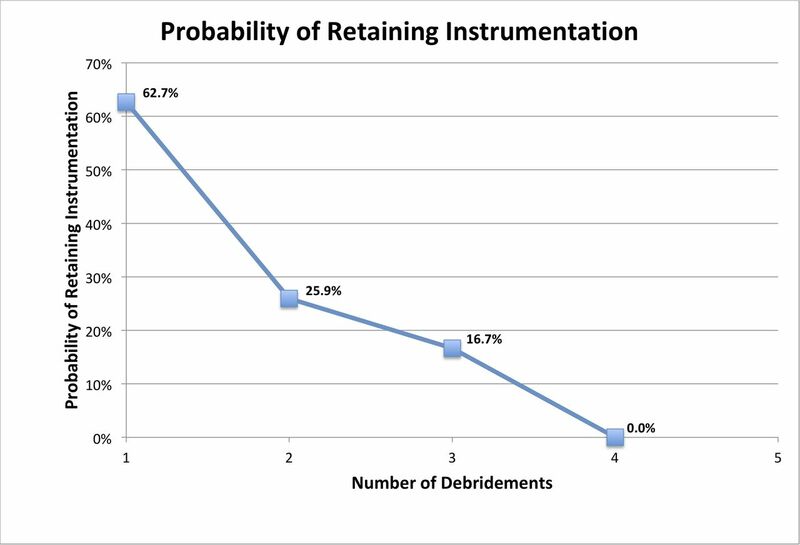 Graphical representation of the probability of retaining instrumentation with each successive surgical debridement. Patients with retention of instrumentation without suppression took an average of 255 days of oral antibiotics (range 7–689 days). Antibiotic regimens are shown in Table 4. These data aimed to analyze patients with SSI following spinal instrumentation that were assigned to 1 of 4 clinical interventions: implant removal, reinstrumentation, instrument retention with antibiotic suppression, and instrument retention without antibiotic suppression. Patient, infection, surgery, and antibiotic characteristics were obtained to see the emergence of any associations to the final clinical outcome. Our result demonstrated that none of the patients with retained instrumentation without suppression had recurrence of infections after long-term follow-up. There is obviously selection bias present in this observation, as the patients taken off of antibiotics were thought to be less likely to have a recurrence of infection. However, it does offer evidence that, in some cases, infected spinal instrumentation can be retained without antibiotic suppression. Although it is hard to definitely state in which cases this lack of suppression is possible, in this series, patients with SSI that present acutely were able to retain their instrumentation after early aggressive debridement. Those with later presentations of infection more likely required removal or exchange of their spinal instrumentation. The earliest recommendation regarding the optimal antibiotic regimen to treat SSI after spinal instrumentation came from Lonstein22 in 1989: 2 weeks of IV antibiotics followed by 3–6 months of oral antibiotics. A more recent study by Kowalski et al23 analyzed 30 early-onset and 51 late-onset spinal implant infections, with the cutoff between early and late being 30 days. They found that early-onset infections could be treated with debridement, antibiotics, and implant retention. Patients with early infection and retained instrumentation took more than 300 days of oral antibiotics. They recommended an oral antibiotic suppression regimen of >6 months. A study by Glassman et al24 that included 19 patients with deep infections after surgery for lumbar fusion made very different recommendations. Seventeen of the 19 patients were given a 6-week course of IV antibiotics, and 2 were given a 2-week course of oral antibiotics, and all infections resolved. Patients in our study who retained implants but were off of suppression had an average of 27 days of IV antibiotics and 255 days of oral antibiotics. Although it is unclear what the lower limit of this suppression should be, Kowalski et al23 did demonstrate the recurrence of symptomatic infection in 5 out of 6 patients who were not given oral suppression therapy for 6 months. The use of rifampin is often recommended by ID consultants, as it is thought to have improved efficacy on adherent stationary phase bacteria in biofilms.25 In this study, however, the use of rifampin did not significantly impact whether patients were able to retain their instrumentation. This study also collected data on intraoperative interventions during the surgical debridements to allow for retention of instrumentation. Many of these interventions have good evidence for preventing SSI when utilized during the index operation, such as vancomycin powder26–28 and dilute betadine irrigation.29,30 However, in our study, none of these interventions were associated with the final clinical outcome. There is no strong evidence in the spine literature defining an algorithmic approach to retained infected spinal instrumentation. A balance must be achieved in maintaining stability of the spine and eradicating the nidus of infection. We recognize that these 2 factors may confound the aforementioned findings and add significant selection bias, as instrumentation that was retained or removed may be based less on the infection and more on the stability of the spine. However, there are preliminary conclusions that can be drawn from these data. First, we believe that lifelong antibiotic suppression may not be required in all cases with infected retained spinal instrumentation. We do recommend a long course of oral antibiotic suppression in such cases; however, the duration is not clear. In this series, infected spinal implants were retained with SSI that present acutely, are not polymicrobial, and were treated with early aggressive debridement. Patients with polymicrobial infections that presented later were more difficult to treat without removal of their original instrumentation. This study has a number of strengths. Rigorous data collection methodology ensured the accurate collection of a large amount of data from patient charts and notes from various specialties, ensuring the capture of all relevant data. The sample size studied is one of the largest samples of patients with infected spine instrumentation and was collected within the last 10 years, making the results relevant to the contemporary practice of spine surgery. This study also holds the longest length of follow-up for such patients, with the follow-up of patients no longer on antibiotics exceeding an average of 4 years. However, this is a retrospective review, an inherent limitation. Further research is obviously needed, perhaps in the form of a prospective study, to further elucidate the length of antibiotic duration necessary for treating infected spinal instrumentation. More important, further research is necessary to establish clinical guidelines and algorithms for surgically treating SSI with spinal instrumentation. Our study demonstrated that none of the patients with retained instrumentation without suppression had recurrence of infections after long-term follow-up. Therefore, we believe that lifelong antibiotic suppression may not be required for all retained spinal instrumentation. In this series, patients with SSI that present acutely after early aggressive debridement were able to retain their instrumentation. Patients with infections detected later are difficult to treat without removal of their original instrumentation. Although there is significant selection bias in this retrospective study as well as the confounding factor of spinal fusion and stability at the time of surgery, this is an interesting trend that should be further explored. Further research is obviously needed to further elucidate the length of antibiotic duration necessary for treating infected spinal instrumentation and, more importantly, to establish clinical guidelines and algorithms for treating SSI with retained spinal instrumentation. Disclosures and COI: All authors declare that they have no conflict of interest with the contents of this manuscript. UCSF IRB Approval: 15-16807. Health care-associated infections: major issues in the early years of the 21st century. Clin Infect Dis. 2007;45(suppl 1):S85–S88. https://doi.org/10.1086/518136. Surgical site infections. Infect Dis Clin North Am. 2011;25(1):135–153. https://doi.org/10.1016/j.idc.2010.11.004. Reduction of surgical site infection in spine surgery: an opportunity for quality improvement and cost reduction. Spine J. 2013;13(9):1030–1031. https://doi.org/10.1016/j.spinee.2013.06.003. Surgical site infections: how high are the costs? J Hosp Infect. 2009;72(3):193–201. https://doi.org/10.1016/j.jhin.2009.03.020. Clinical outcomes after lumbar fusion complicated by deep wound infection. Spine (Phila Pa 1976). 2012;37(16):1370–1374. https://doi.org/10.1097/BRS.0b013e31824a4d93. Clinical outcome of deep wound infection after instrumented posterior spinal fusion: a matched cohort analysis. Spine (Phila Pa 1976). 2009;34(6):578–583. https://doi.org/10.1097/BRS.0b013e31819a827c.
. Incidence, prevalence, and analysis of risk factors for surgical site infection following adult spinal surgery. Spine (Phila Pa 1976). 2009;34(13):1422–1428. https://doi.org/10.1097/BRS.0b013e3181a03013.
. The presentation, incidence, etiology, and treatment of surgical site infections after spinal surgery. Spine (Phila Pa 1976). 2010;35(13):1323–1328. https://doi.org/10.1097/BRS.0b013e3181bcde61. Proceedings of the International Consensus on Periprosthetic Joint Infection. Bone Joint J. 2013;95-B(11):1450–1452. https://doi.org/10.1302/0301-620X.95B11.33135. Management of periprosthetic joint infection: the current knowledge. J Bone Joint Surg Am. 2012;104(14):1–9. https://doi.org/10.2106/JBJS.K.01417. Periprosthetic joint infection. Lancet. 2016;387(10016):386–394. https://doi.org/10.1016/S0140-6736(14)61798-0. A large multicenter study of methicillin-susceptible and methicillin-resistant staphylococcus aureus prosthetic joint infections managed with implant retention. Clin Infect Dis. 2013;56(2):182–194. https://doi.org/10.1093/cid/cis746. Polymicrobial prosthetic joint infections: risk factors and outcome. Clin Orthop Relat Res. 2008;466:1397–1404. https://doi.org/10.1007/s11999-008-0230-7. Management of infection after instrumented posterior spine fusion in pediatric scoliosis. Spine (Phila Pa 1976). 2007;32(24):2739–2744. https://doi.org/10.1097/BRS.0b013e31815a5a86. Loss of coronal correction following instrumentation removal in adolescent idiopathic scoliosis. Spine (Phila Pa 1976). 2006;31(1):67–72. https://doi.org/10.1097/01.brs.0000192721.51511.fe. Delayed infections after posterior TSRH spinal instrumentation for idiopathic scoliosis: revisited. Spine (Phila Pa 1976). 2001;26(18):1990–1996. https://doi.org/10.1097/00007632-200109150-00009. Failure of attempted implant retention in spinal deformity delayed surgical site infections. Spine (Phila Pa 1976). 2009;34(1):60–64. https://doi.org/10.1097/BRS.0b013e31818ed75e. Delayed infection after elective spinal instrumentation and fusion. A retrospective analysis of eight cases. Spine (Phila Pa 1976). 1997;22(20):2444–2451. https://doi.org/10.1097/00007632-199710150-00023. Wound infections following spinal fusion with posterior segmental spinal instrumentation. Clin Infect Dis. 1997;24(4):558–561. Management of postoperative infections after spinal instrumentation. J Neurosurg. 1997;86(6):975–980. https://doi.org/10.3171/jns.1997.86.6.0975. Treatment of postoperative wound infections following spinal fusion with instrumentation. J Spinal Disord. 1995;8(4):278–283. Diagnosis and treatment of postoperative spinal infections. Surg Rounds Orthop. 1989;3:25–32. The management and outcome of spinal implant infections: contemporary retrospective cohort study. Clin Infect Dis. 2007;44(7):913–920. https://doi.org/10.1086/512194. Salvage of instrumental lumbar fusions complicated by surgical wound infection. Spine (Phila Pa 1976). 1996;21(18):2163–2169. https://doi.org/10.1097/00007632-199609150-00021. Role of rifampin for treatment of orthopedic implant–related staphylococcal infections: a randomized controlled trial. JAMA. 1998;279(19):1537–1541. https://doi.org/10.1001/jama.279.19.1537. Cost savings analysis of intrawound vancomycin powder in posterior spinal surgery. Spine J. 2014;14(11):2710–2715. https://doi.org/10.1016/j.spinee.2014.03.011. Intrawound vancomycin to prevent infections after spine surgery: a systematic review and meta-analysis. Eur Spine J. 2015;24(3):533–542. https://doi.org/10.1007/s00586-014-3357-0. Intrawound vancomycin powder eradicates surgical wound contamination. J Bone Jt Surg. 2014;96(1):46. https://doi.org/10.2106/JBJS.L.01257. Efficacy of dilute betadine solution irrigation in the prevention of postoperative infection of spinal surgery. Spine (Phila Pa 1976). 2005;30(15):1689–1693. https://doi.org/10.1097/01.brs.0000171907.60775.85. The influence of perioperative risk factors and therapeutic interventions on infection rates after spine surgery: a systematic review. Spine (Phila Pa 1976). 2010;35(suppl 9):S125–S137. https://doi.org/10.1097/BRS.0b013e3181d8342c.